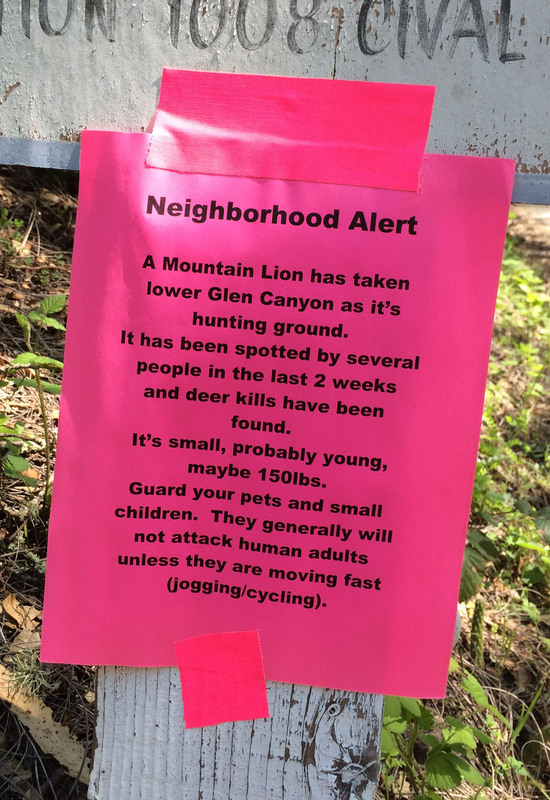 This sign (photo) appeared at the end of our driveway a couple days ago warning residents of the canyon of a new resident, a young mountain lion. For me, this was exciting news, as with all my years hiking in the wild, stalking and tracking wildlife, and attempting to spot signs of wildlife presence, spotting a mountain lion in the wild has remained elusive. My wife, Lynn, came across two lions while running in the Coronado National Forest in Southeastern Arizona barely a quarter mile from our campsite, but from the time I heard her scream until I got to her they had disappeared into the brushy hillside – and I didn’t see them (since her penetrating scream likely sent them scurrying to safety). And it’s likely that I will not see our newest resident either. But it does bring back to mind safety measures when in lion territory, and as RVers who enjoy nature and the outdoors, you will pass through or camp in lion territory at some point. Here are are some facts to know, and some tips if you do see a mountain lion in the wild (lucky you). Mountain lion attacks on people in North America have increased dramatically since 1986. For example, in California, there had been only two fatal attacks–in 1890 and 1909–and then no further attacks for 77 years–until 1986. Attacks have occurred in California, Colorado, and Canada. So if wherever you are doesn’t start with a “C” you can breathe a little easier. Mountain lions, also known as cougars, catamounts, and panthers, have in recent years changed their habits, as hunting is either illegal or controlled in most states, development has encroached on their habitat, and suburban pets have become an abundant and easy food source. You may not spot a mountain lion in the Allegheny or Catskill Mountains yet, but they are increasing their range and moving eastward. First of all, it is rare to see a mountain lion in the wild (80% of mountain lion sightings are actually something else). Their general hunting modus operandi is to hide, lying in wait along game trails for prey to pass. When hiking, hike in a group (most attacks have been to solo hikers or runners). If you sight a cougar and it does not run away, take aggressive action: 1) Make yourself appear as large and threatening as possible: If you are with a small child, put him/her on your shoulders. Hold your backpack over your head, raise your arms and wave. 2) Scream threateningly at the animal (most of its prey will run, so your actions will confuse it), throw rocks (don’t stay bent over too long to pick up rocks, as you will appear small and an easier target ), 3) If attacked, fight back aggressively with rocks, sticks, fingers in the eyes, 4) After you chase it away, write an article for a magazine and make big bucks. Reality check : You are 10 times as likely to be killed by a dog as a mountain lion, and 2,000 times more likely to be killed by a car. We all seem to be more terrified and afraid of something that we know little about—like mountain lions—and could even, sadly, deter us from hiking. If this were a rational decision, then we would long ago have avoided pet dogs, and we certainly wouldn’t ride in a motor vehicle. · 100 human deaths in auto collisions annually with deer. · 86 deaths due to lightning strikes. · 40 deaths due to bee stings. · 18-20 people killed by dogs (also inflict suture-requiring injuries on 200,000 people). · 12 human deaths resulting from 5,000 rattlesnake bites.
. 3 deaths due to bites of black widow spiders. For more RVing articles and tips take a look at my Healthy RV Lifestyle website, where you will also find my ebooks : 111 Ways to Get the Biggest Bang for your RV Lifestyle Buck (PDF or Kindle), BOONDOCKING: Finding a Perfect Campsite on America’s Public Lands (PDF or Kindle), Snowbird Guide to Boondocking in the Southwestern Deserts (PDF or Kindle), The RV Lifestyle: Reflections of Life on the Road (Kindle reader version), and my newest Boondockbob’s Guide to RV Boondocking (Kindle). NOTE: Use the Kindle version to read on iPad and iPhone or any device that has the free Kindle reader app. I have been fortunate enough to see one in the wild while camping in northern Arizona. I have also seen one in the city (near Orlando, Florida). They are amazing creatures! Thank you for posting this nice article. I’ve crossed paths with bears before (without bloodshed) but I have to admit that a mountain lion would be new. Ironically, it’s our cat I’d be worried about. I love #4!! Made me laugh!! !